Around three kilometers east of the Nagoya Castle main enclosure, Tokugawaen was created by Mitsutomo Tokugawa, the second-generation lord of the Owari Clan, the foremost of the three main clans. Tokugawaen is said to have arisen out of Mitsutomo's building of a retreat in Ozone in 1695. Originally it stretched for some 44 hectares, and the spring in the grounds held boats of considerable size. Following Mitsutomo's death, this land was handed over to the Naruse, Ishikawa and Watanabe families-all chief retainers of the Owari clan-but was the side for the Owari Tokugawa family residence in 1889. In 1931, the residence and gardens were presented to Nagoya City by the ninth head of the family, Yoshichika, and the city went about restoring the property to its former glory, opening it to the public the following year as "Tokugawaen". Tokugawaen did not escape the ravages of WWII, however, with most of its trees being lost to fire in air raids. 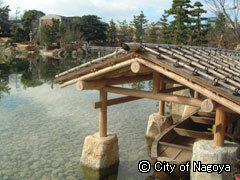 Following the end of the war, Tokugawaen was remodeled as a modern urban garden, which was restored and developed as a Japanese garden in 2001 to be opened in 2004. Making effective use of the river terrace landscape of the Yatagawa River, Tokugawaen's defining features are the aesthetically staggered terrain, use of evergreen forests and large rock arrangements that bring a wonderful three-dimensional facet to the gardens. Indeed, the gardens are structured so that the variety on offer is presented in a very dramatic way. 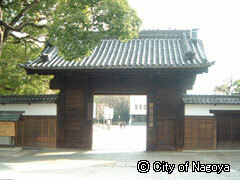 The black gate at the main entrance is from the Tokugawa family residence, built in 1900. The all-zelkova gate is in the sangen yakuimon style that features a gable roof. The gate, together with the long row-house and walls, is one of only a very few items that escaped damage in WWII air raids in 1945. 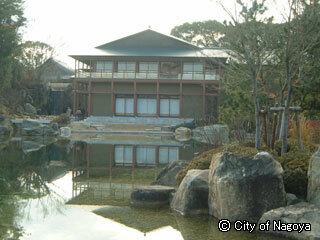 Indeed, this collection of buildings is a precious example of that samurai household that remains in existence today. <City Bus> 3 minutes' walk from "Tokugawaen Shindeki"
<Meitetsu Bus> 3 minutes' walk from "Tokugawaen Shindeki"